Have you ever wondered where a certain bus ran during its life? To find out requires delving through many lists of company allocations, either official or those compiled from personal observation. In the case of a large company with many depots spread across the west country this can be a formidable task. Thanks to WHOTT Member, Geoff Hobbs, much of this work has been studied i n depth and the result is a one-stop reference book listing all vehicles in the Western National group of companies between 1971 and 1982. This twelve-year period saw many changes and the consequential renumbering of some vehicles, a situation which had not happened before. It also ended at the moment the company was broken up into smaller autonomous units as a prelude to privatisation. Vehicles surviving at this date are easily identifiable to new ownership. While Geoff’s study has pinpointed every change from month to month, a book describing such detail would be prohibitive in its size and format. Anyone wishing to access that level can do so through the WHOTT archive, but the book we have just published shows the principal allocation of each vehicle over a six-monthly period January – June and July – December. It is backed by some other interesting statistics. Over the period of its existence the Western National and Southern National companies used well over 150 different operating centres, ranging in size from depots holding up to 100 vehicles, down to small outstations with just one. Some of these still exist today but the greater majority have long since gone, or their use changed to something totally different. The depots and facilities of a bus company are an important ingredient to the whole operation and this book attempts to describe the locations, shape and size of each place, with the aid of original maps and official drawings, as well as photographs to illustrate them at various stages of their use. Arranged alphabetically, this volume covers places beginning with the letters M – Y and complements the first volume that came out last year, covering places beginning A – L.
Produced on high quality paper for good reproduction of maps and illustrations, the reader will grasp a fuller understanding of the premises used by both companies, when they came into being and from whom some were acquired. Not only garages, but bus stations and booking offices are also given a mention, particularly in towns where the company had more than one place. Over the period of its existence the Western National and Southern National companies used well over 150 different operating centres, ranging in size from depots holding up to 100 vehicles, down to small outstations with just one. Some of these still exist today but the greater majority have long since gone, or their use changed to something totally different. The depots and facilities of a bus company are an important ingredient to the whole operation and this book attempts to describe the locations, shape and size of each place, with the aid of original maps and official drawings, as well as photographs to illustrate them at various stages of their use. Arranged alphabetically, this volume covers places beginning with the letters A – L and a second volume will follow next year covering the rest from M to Y. The reader will grasp a fuller understanding of the premises used, when they came into being and from whom some were acquired. Not only garages, but bus stations and booking offices are also given a mention, particularly in towns where the company had more than one place. Presented on good quality paper for best reproduction and part colour, the book contains 65 photos, 26 maps and 33 plans drawn from the WHOTT archive, most of which have not been published before. A4 landscape, 100 pages, card cover, the book complements the shape and size of The Years Between (Vol 3) that was published in 1990. Material for both books was extracted from WHOTT’s own archive. Part One - 65 photos, 26 maps and 33 plans. Part Two - 165 photos, 37 maps and 32 plans. The Years Between (Vol 3) that was published in 1990. Purchased singly £14-00 plus £2-30 post and packing – total £16-30. Purchased as a pair £26-00 plus £2-90 post and packing – total £28-90. on 16th August 2015, the book has been in great demand since. Well over 900 different vehicles were operated by the company during its existence and a large proportion of these were bought second hand. Full details are given, each one-vehicle per-line entry occupying four pages of information. The book, which complements Andrew Waller’s definitive history of the company, has 100 B/W illustrations not published before. A4 portrait, stiff card covers in colour, 95 pages. SOUNDS MECHANICAL - My Life - by Colin Shears - Having reached the age of eighty earlier this year, Colin Shears has put pen to paper and tells the story of his life surrounded by vehicles of all types, with a particular fascination for buses. Colin was one of the pioneers of commercial vehicle preservation, saving many interesting models from extinction at a time when most enthusiasts concentrated on cars. His story is regularly punctuated with descriptions of the sounds vehicles made, not only the exhaust note but the various whines in gearboxes and back axles. Originally occupying several sheds around Exeter and the grass verge of his parent’s house, Colin managed to purchase the Winkleigh aircraft hangar in the early ‘sixties and move his collection there. Now home to vehicles of many types, the site has become a mecca for enthusiasts each October. This book contains images of Colin’s life and examples of the vehicles that have passed through his hands. 40 pages, 36 pictures, mostly black and white. The Minibus Years - Thirty years ago the bus industry witnessed a dramatic change in vehicle type with the introduction of very frequent small buses replacing lumbering giants on a much less frequent headway. Exeter was the teething ground for a carefully planned conversion of services from double-deck to 16-seat Ford Transits. Closely watched by other companies around the country, Devon General’s experiment was largely adopted elsewhere. Within a short time all the main operators were using them, but not all were Ford Transits. There was even variety in the diminutive bus and examples of this can be found in our latest publication put together by Robert Crawley, who describes the many types found in Cornwall, Devon, Somerset and Dorset. Size A5, 48 pages, 82 coloured illustrations and with a Foreword by Harry Blundred, who was the man behind the concept of high frequency, hail and ride travel. Order your copy today. One Hundred years of AEC in the West Country - The Associated Equipment Company (AEC) was formed one hundred years ago this year. It emerged from the London General Omnibus Company’s own bus chassis production facility at Walthamstow and later moved to a purpose-built factory at Southall. On top of the continuing demands for bus chassis, AEC quickly established itself as a lorry chassis manufacturer after securing large orders for its Y type from the government who required many hundreds of them for use during the first world war. After the 1919 armistice AEC embarked on a reconditioning programme, making good surplus military models for the commercial market. The Y type and its derivatives continued in production alongside until entirely new products began in 1924. From then until the 1968 absorption of AEC into the Leyland family, the company produced many thousands of chassis, suitable for bus and lorry work, as well as some other special lines. The early classes were identified by a numeral but in this book you’ll not only see references to these, but also the later Regals, Regents, Reliances, Majestics, Mercurys, Monarchs, Mammoth Majors, and the famous 4x4 Matador variant produced during the second world war for military use, a model that also went on to see many more years in the civilian arena. Authors Philip Platt and John Sykes have put together 100 illustrations of AEC models at work in the west country, paying tribute to the many types that AEC supplied throughout the entire period of production. Largely an illustrated account with extended captions, the reader will also discover some interesting tables of west country dealers and the particular models they supplied. The book, A5 in size, contains both black & white and coloured illustrations. The four titles – Sounds Mechanical, The Minibus Years, AEC in the West Country and West Country Lightweight Single-Decks are £3 each if purchased singly. ordered together now available for £5, any three for £7, or all four for £9. Wheels of the West - a unique new soft cover A4 book edited and compiled by WHOTT friend Peter Killick, gives an overview of west country goods transport c1950 to 1965. Using facsimile material direct from the pages of the Commercial Motor and other journals, as well as material from the WHOTT archives, there are articles on BRS, private hauliers and own account operators as well as industry comments and interesting material on the Rowe Hillmaster. Copiously illustrated. Also included is an extensive appendix listing most of the hauliers of the period. Exeter Trams - A celebration of the Centenary of Exeter’s Electric Trams published by WHOTT in 2005. 8-page glossy black & white illustrated publication with an extensive account of the tramways development drawn from research carried out by Ted Crawford and the late Jack Gready and subsequently donated to WHOTT. 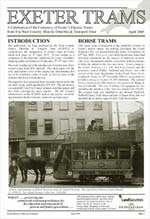 Torquay Trams - A celebration of the Centenary of Torquay's Electric Trams published by WHOTT. One of the last tramway systems to be adopted in Britain was that at Torquay on 4th April 1907. After a prolonged start a network of surface electrical contacts was laid by the Dolter company and soon after the Torquay Tramways Company (a subsidiary of NECC) was formed to operate them. Twelve pages with coloured centre fold map. A set of eleven colourful cards with attractive scenes from ‘thirties posters depicting Western National and Southern National. Printed for use either as postcards to be sent to a friend, or kept as album souvenirs. £0.45 each or £4.50 for the set.